What do you look for in a multi pen? Are the ink options at the top of the list? A manageable barrel size? A cool design? I personally haven’t put much thought into it, but I always seem to focus on the type of ink and how it writes first, and then the quality and the build of the barrel second. The Staedtler Avant Garde Light has a lot of great things going for it, but one minor issue keeps it from being perfect. The first thing that jumps out at you about the Avant Garde is the barrel design. It is chock full of “just rights”. It is just the right length, just the right diameter, and just the right weight. This is a really nice pen to hold, and I think it is the aluminum body construction that does the trick. I especially like the clip design. The pen contains two ballpoint ink cartridges - 0.7mm black and red - and an 0.5mm pencil, which is honestly not that common in multi pens. Most with a pencil component are 0.7mm, so that is a nice bonus. To swap between cartridges, the Avant Garde uses what I (probably incorrectly) call gravity switching. Essentially, you hold the pen sideways and face the marker for the cartridge you want towards you and click the plunger. A single button retracts all cartridges, and you just rotate the barrel and click for the next one. I’m making it sound more complicated than it really is - it’s very simple. Where the issue lies for me is the “click clack” sound the pen sometimes makes when writing. I think the combination of internal components and aluminum barrel are causing this, but mostly it is my writing style. If you couldn’t tell by now I am a printer. What that really means is I lift the pen up and down as I write my letters across the page. This causes the clicking sound with this pen. When I switch over to writing in a cursive style, I hear nothing because my writing style is smoother. So, I’m torn. I like everything about this pen, but for my writing style it isn’t the best choice. I am going to keep using it though because it is too nice to set off to the side. 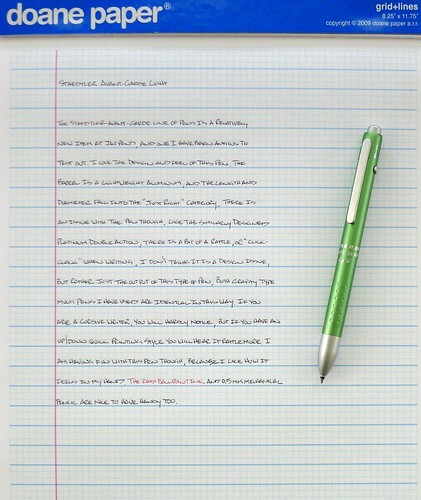 Posted on September 6, 2011 by Brad Dowdy and filed under Multi Pen, Pen Reviews, Staedtler.